It has been touted as one of the most recognizable wallpapers in the world…. 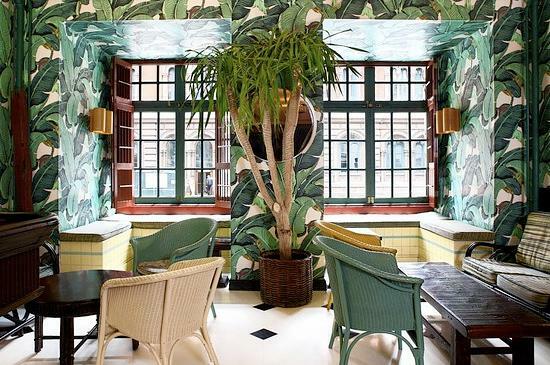 “The Original” Martinique Banana Leaf wallpaper, which was created by decorator Don Loper in 1942 for the Beverly Hills Hotel, has since developed an iconic status amongst the design world. 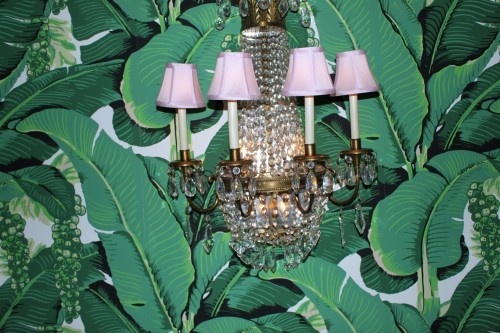 I actually can’t remember when – or how – I first fell in love with this wallpaper, but I do know one thing…. It wasn’t Mr. Loper’s fabulous Martinque I fell in love with. 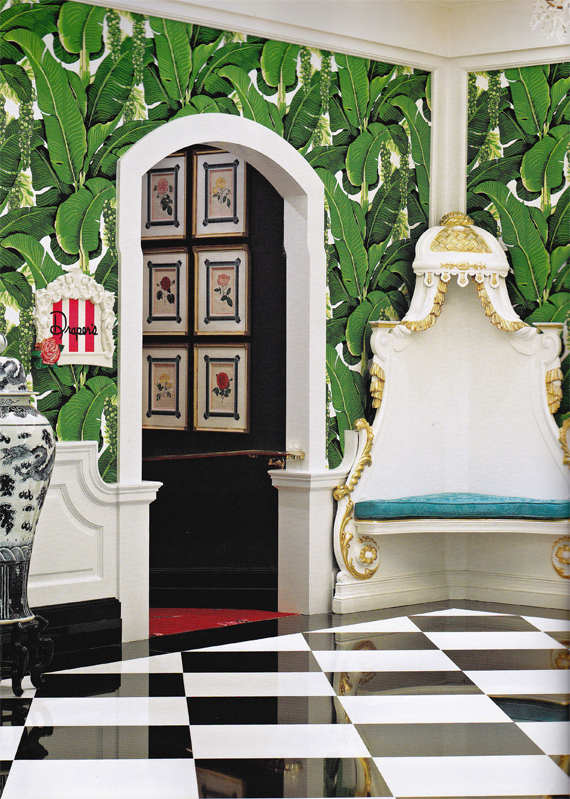 It was my design idol Dorothy Draper’s Brazillance wallpaper, made famous at the Greenbrier Hotel in West Virginia. Look closely…. 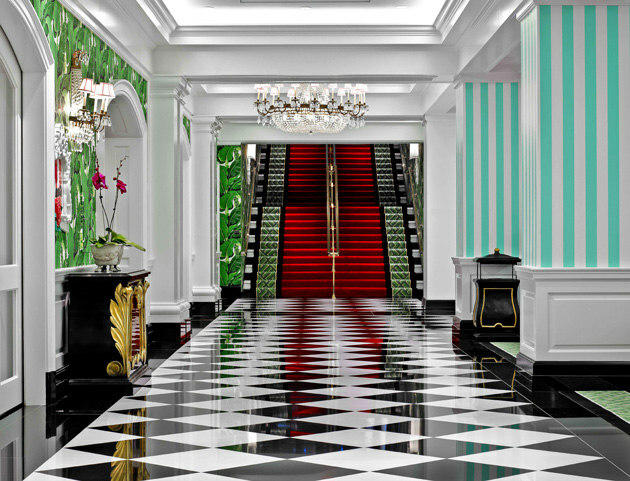 The Greenbrier Hotel, renovated in the 1940s by Dorothy Draper, and refreshed in 2007 by her protégé Carleton Varney. It is easy to get confused! The two patterns look almost identical in pictures. 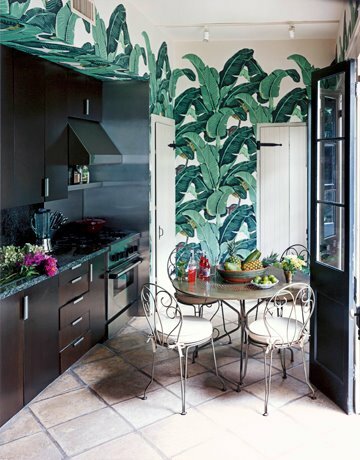 Not realizing the difference, I had convinced myself (and more importantly, my husband) that I simply would die if I did not have our Florida dining room wallpapered in in the oh so Palm Beach Chic Martinique Banana Leaf. 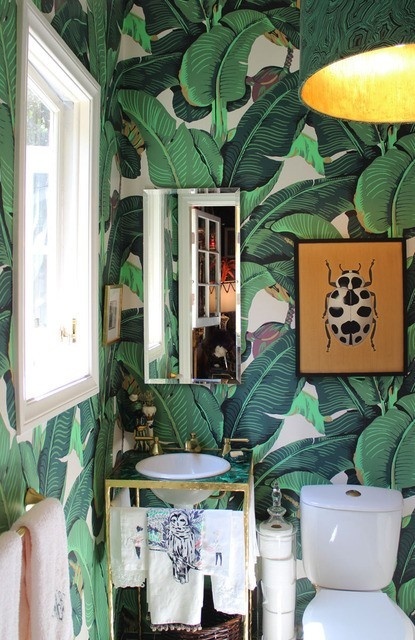 I obsessed over every room featuring this wallpaper which has graced Nicky Hilton’s Los Angeles home and has been featured in top home décor magazines such as House Beautiful and ElleDecor. 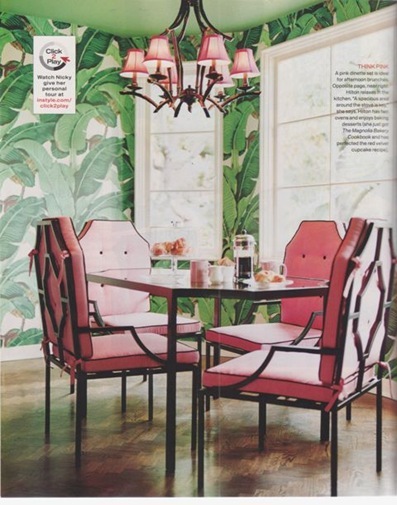 Nicky Hilton’s breakfast room was featured in InStyle magazine. 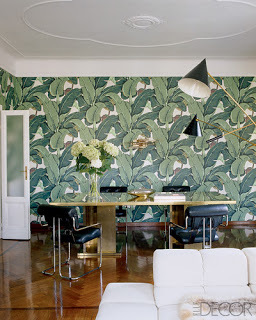 Brian Atwood & Nate Berkus’s Milan Home via ElleDecor. I ordered a sample of the Martinique wallpaper, and I must say I was a bit disappointed. The leaves were not the bright green I had imagined, and it had a creamy background with quite a bit of brown, described on their website as “burgundy and deep mustard.” And then there was the price… $249.95 per SINGLE roll, ouch. 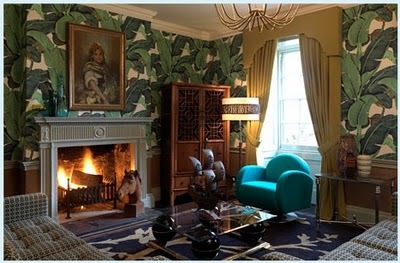 I kept going back to the vibrant images of the Greenbrier, and then I noticed something… Are those Sea Grapes?? That is when I realized these were two different patterns! After a bit more research, I discovered that Carleton Varney produces all the original fabrics and wallpapers of Dorothy Draper, including her Brazillance. I promptly ordered a sample, and to my delight, a DOUBLE role was $136… a huge savings! Furthermore, the colors were exactly what I was looking for, including bright Pantone 2013 Color of the Year emerald green, as opposed to Martinique’s army green and mustard tones. It also had the crisp super white background I was looking for, and it contains black accents as opposed to brown, which is just so much more… well, Dorothy Draper. Mr. Varney’s patterns are available for purchase through Carleton Varney by the Yard or through the Greenbrier Hotel Gift Shop. 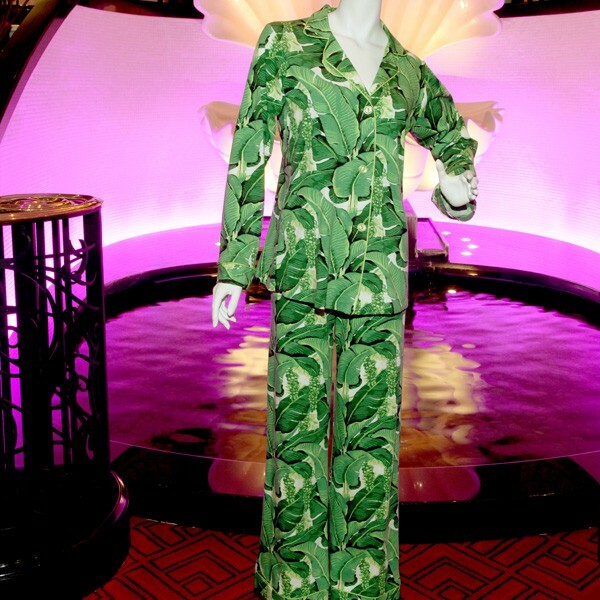 While you are there, check out their fabulous line of Brazillance pajamas and robes! 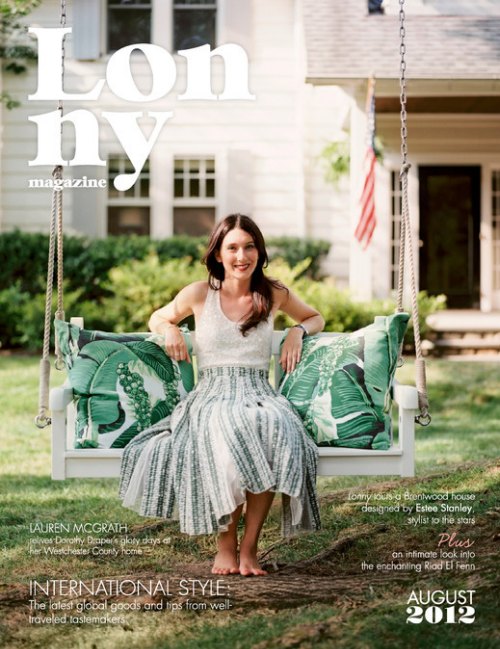 Also check out the August 2012 Issue of Lonny Magazine featuring Lauren McGrath of Good Bones, Great Pieces on the cover. Lauren was so inspired by Dorothy Draper’s Brazillance that she created a beautiful setting for a summer dinner party on the shaded lawn of her Westchester County home. 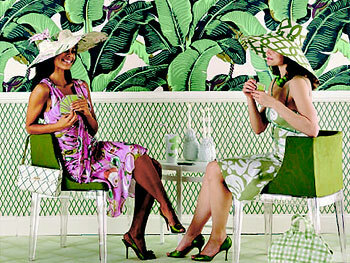 Brazillance wallpaper is also featured on the front of Bergdorf Goodman’s Fall Preview 2012 catalogue, and there is an amazing fashion photo shoot from the Greenbrier inside! PLEASE NOTE: This image has clearly been filtered, as it is NOT an accurate reflection of the bright Brazillance colors. Here are a few more pictures Martinique Banana Leaf I uncovered of through my exhaustive search and quest for knowledge on these amazing wallpapers. I would love to find more Brazillance pics, if you have any please send them my way! Our Dorothy Draper inspired Brazillance-enveloped dining room should be finished in February. Another Martinique bathroom, source unknown. 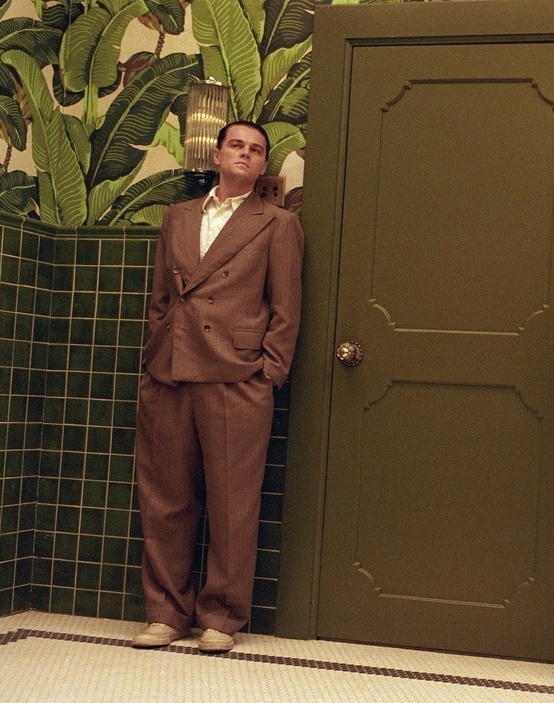 A fabulous Art Deco bathroom, papered in Martinique Banana Leaf, for The Aviator, a movie about the life of Howard Hughes. 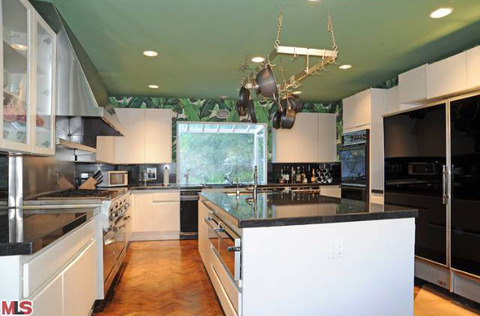 A New Orleans kitchen featured in the October 2008 issue of House Beautiful magazine. It can even be found across the pond in Norfolk’s lounge at Carrington House. 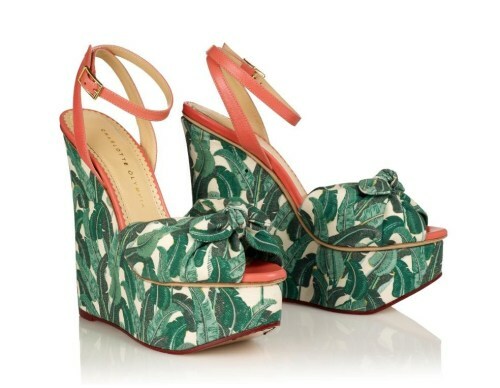 Banana Leaf clad shoes and bags, Spring 2012. So which palm pattern gets your vote? Martinique Banana Leaf or Dorothy Draper’s Brazillance? 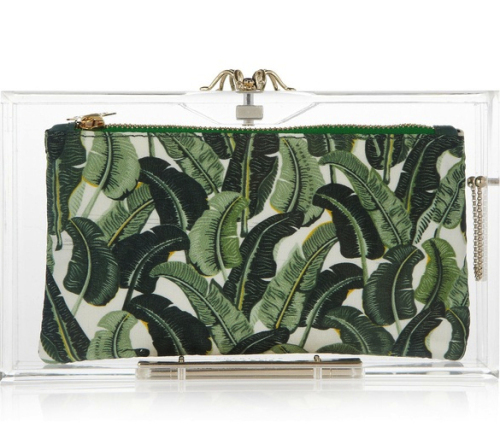 « Circa Who Epitomizes Palm Beach Chic! Oh, thank you so much for placing me in such illustrious company! I think we must be twins. Thank you, Tabitha! 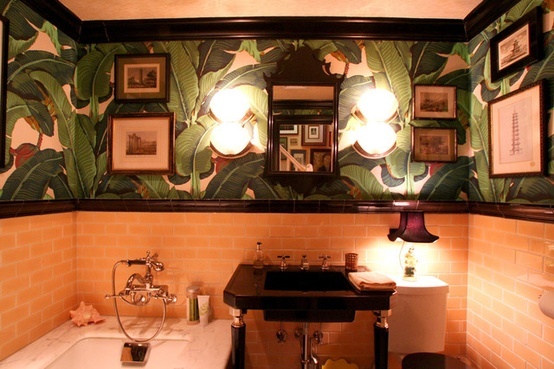 I love, love, LOVE your blog, and your Martinique bathroom is fabulous!! Oh and that's fascinating about the patterns, as I'm in UK it cost me $600 a roll! Oh I'm trying to follow you, can you add an icon on your blog? Ok I really thought I had decided on my wall paper choice. Then bam!!! Along comes this great post and I'm back to rethinking my first and very safe choice, grass cloth. Hummmmm……. That wallpaper is SICK!!!! Both of them…..if I wasn't so fickle I would add a room of it in my home…. :) Can't wait to see how yours turns out! 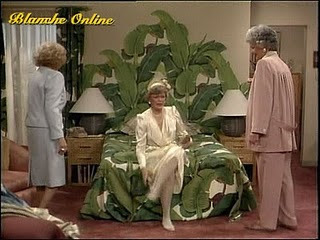 You can also buy the Martinique pattern from that same company or from Hinson in NYC. It is still being manufactured by the original company and has been since 1942. And the original company, C.W. Stockwell, is and has been in business since the early 1900s, selling “Martinique” since its inception in 1940. Go to CWStockwell.com and let them hear from you. I got SO excited when I found this post (even though it's a bit old and I'm late) because I've been trying to hunt down this wallpaper FOREVER.. I love the Martenique but its waaaay too expensive. I'd love to know if their price increased as well. Thank you so much for popping by, and please let me know if you buy the wallpaper… I'd love to see pics! I just checked: It is now $330 for a double roll at Carleton Varney. It is $188 a single roll at Designer Wall Coverings. 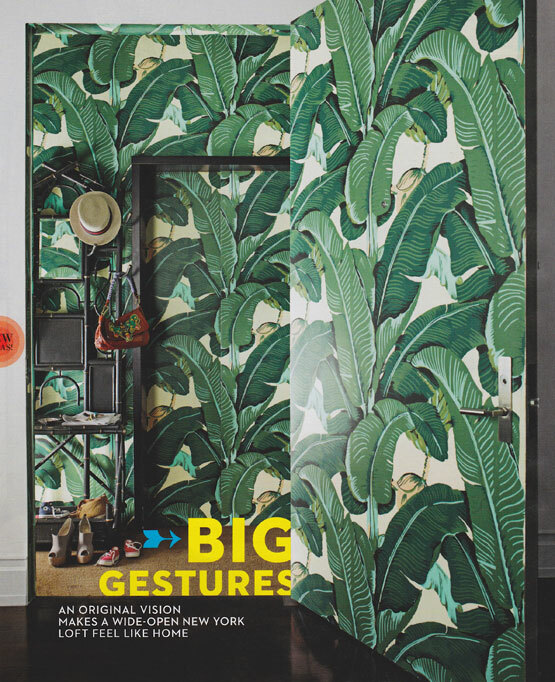 Oh so excitted to discover this wallpaper in a magazine [Australian Vogue] and then accidentally you by looking for an image to pin. Yay. Win win. Love what I am seeing. Your Glam Pad is right up my street, however far away. cheers! SInce I have visited both The Greenbrier and The Beverly Hills Hotel and Love both. I actually prefer The Banana Leaf. It looks crisp and I love the pink accents as opposed to the Turquoise. But my all-time favorite hotel look is the fabulous Grand Hotel on Mackinac Island. It is another Carlton Varney look and it is wonderful. Come to my etsy store and I can supply the Brazilliance fabric by the yard. So glad I found this post. Thanks for the info and comparison of the two. I'm totally leaning toward Brazillance now! I'm dying to see your finished dining room but it didn't come up on a search of your blog. Please let me know where I can find it! Thanks! Both are lovely, but like you, I prefer the print with more saturation in the colour. This is such an amazing post – so informative. I'm currently researching the pattern since it's something I've also loved. Thank you for the great resources! TwentyOne7 carries the Dorothy Draper fabric and wallpaper at prices well below retail. 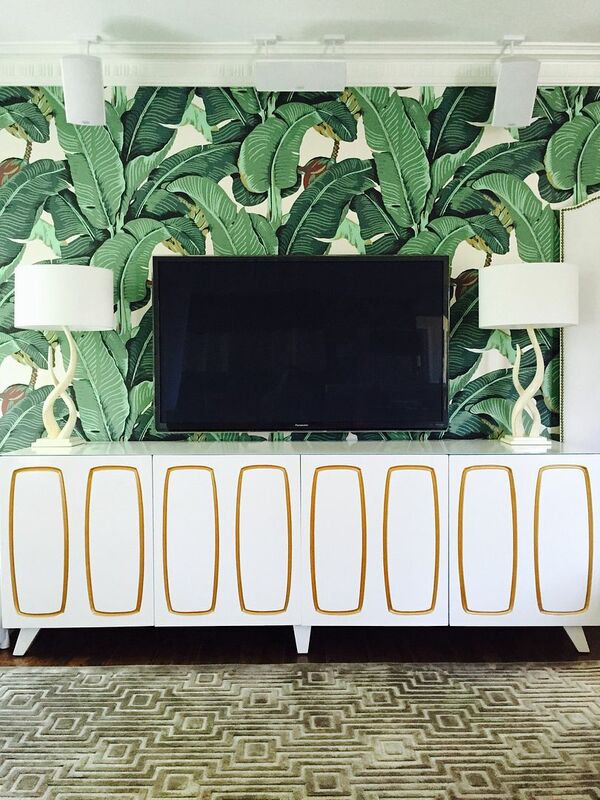 We can't begin to tell you how popular the Dorothy Draper Brazilliance pattern has been lately in the wallpaper and fabric. Giving you exclusive access to "To The Trade" fabrics at prices well below retail! 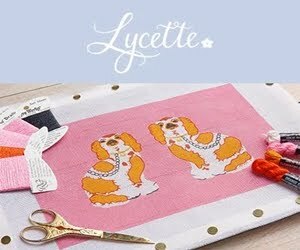 list of beautiful, chic and in style fabrics. Again, what we show is just the tip of the iceberg! The people at Designer Wallcoverings offer no charge memos to the trade and well known customer service. Anyone know a supplier in the Uk? OR a way to get a sample of Brazilliance? It's a bit if a struggle! DesignerWallcoverings.com offers this product world wide. They are the exclusive online resource for this product for over 10 years. Great service too. Greetings! 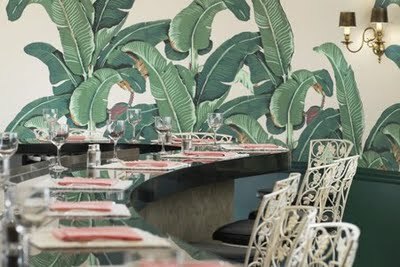 I realize this is a rather old post, but I’m scouring the internet looking for the best price on Brazilliance wallpaper. The best I’m finding is around $400 per double roll. If anyone has a lead on this at a better price, please feel free to email me at connorLcarson at yahoo dot com.